Grammar is tested in Parts B and C of the SAT French Subject Test. Part B tests only grammar, while Part C tests both grammar and vocabulary. The same points of grammar are tested in Parts B and C. The SAT French Subject Test contains questions about very specific aspects of French grammar. Therefore, grammar is one of the easiest test topics on which to improve. If you can remember and master a few rules, you’ll easily get more points. This chapter will explain exactly what you need to know. First, look at the point-by-point summary of the question types you can expect. Then, keep the question style in mind as you review your French grammar. Not all that you have learned in school will be included in the test, but you may find it helpful to go back to your textbooks for more examples on the topics we suggest. We focus on the grammatical topics and difficulties most often encountered on the SAT: pronouns, verbs, prepositions, and adverbs. Part B will consist of approximately 15 to 20 questions, placed in order of difficulty. The first third of the questions will be easy, the next third will be of intermediate difficulty, and the final third will be the most challenging. In these questions, there will be a sentence with a blank. You will choose the answer that is grammatically correct. Directions: Each of the following sentences contains a blank. From the four choices given, select the one that can be inserted in the blank to form a grammatically correct sentence and fill in the corresponding oval on the answer sheet. Choice (A) may consist of dashes that indicate that no insertion is required to form a grammatically correct sentence. Jean-Claude est venu avec -------. The correct answer is (C). Part C tests both grammar and vocabulary. In this section, there are approximately 12 to 20 questions in no clear order of difficulty. On this part of the test, several questions are combined in one paragraph. You may have three or four mini-paragraphs with three to five blanks within each, or you may have one long paragraph. You are asked to select the answers that best complete the sentences on the basis of either vocabulary or grammar. Directions: The paragraphs below contain blank spaces indicating omissions in the text. For some blanks, it is necessary to choose the completion that is most appropriate to the meaning of the passage; for other blanks, you must choose the one completion that forms a grammatically correct sentence. In each case, indicate your answer by filling in the corresponding circle on the answer sheet. Be sure to read each paragraph completely before answering the questions related to it. This section combines the characteristics of Parts A and B. The small differences between the two are discussed at the end of this chapter. All the grammar questions on the SAT French Subject Test will fall into one of the following four categories. The best way to improve in these areas is to learn the grammatical rules that are tested again and again. These rules are covered in the following grammar review. Grammar is a great area to focus your attention for this test. Why? Because to do well on the grammar review you need to review only a limited number of rules. Those rules will lead you to the right answer again and again. Unlike vocabulary, where luck determines whether the words you’ve learned will show up, grammar rules—and therefore, the content of these test questions—stay the same. You’ll be tested primarily on three things: pronouns, verbs, and prepositions. Each question will address only one grammatical point. We’ll cover each of these categories, giving you the rules that get you right answers. We’ll also give practice questions for each category. Finally, we’ll cover some odds and ends that occasionally show up on the test. You won’t be tested on this material, but take a quick look through to make sure that you understand what the following terms mean. We’ll be using them in this grammar review. 7. Auxiliary verb—a helper verb, either avoir or être, that loses its own meaning to help form the compound past tense for other verbs, such as the passé composé. It is followed by the past participle of the conjugated verb. A quarter of all grammar questions on the SAT French test will challenge your knowledge of pronouns. Unlike English, which uses mainly two basic forms of pronouns (he and him, for example), French uses four important forms of pronouns: subject pronouns, direct object pronouns, indirect object pronouns, and stressed pronouns. A pronoun takes the place of a noun. It stands in for the full name or description of a person, place, or thing. In French, a pronoun will take different forms depending on what type of noun it replaces. Half of the pronoun questions on the test ask you to choose among subject pronouns, direct or indirect object pronouns, and stressed pronouns. The following are the pronouns you should know. You’re most likely to be tested on third-person singular and plural, since these are the forms that change the most. Because this is a multiple-choice test, you will be asked which of four pronouns go into the blank. Notice that some pronouns are always the same: nous and vous. Subject pronouns replace the subject of the sentence. Jean a montré son dessin à Edith. Jean showed his drawing to Edith. Il a montré son dessin à Edith. He showed his drawing to Edith. These pronouns are usually the wrong answer choices. Why? Because these are the pronouns with which everyone is most familiar and comfortable. Jean l’a montré à Edith. Jean showed it (the drawing) to Edith. Notice that the direct object pronoun is placed before the verb. and le or la becomes l’. These pronouns replace the indirect object of a sentence. The indirect object answers the questions “to what?” or “to whom?” Notice that the pronoun replaces both the indirect object and the preposition that goes with it. Jean lui a montré son dessin. Jean showed her his drawing. Review the list of verbs that take the prepositions de or à or both, and their meaning. Some of them are listed on this page of this book. le/la/l’ vs. lui and les vs. The verbs écouter (to listen to), regarder (to look at), and attendre (to wait for) are verbs that take a direct object in French. We are waiting (for) them. The verbs téléphoner à (to call on the phone), répondre à (to answer), demander à (to ask), and rendre visite à (to visit someone), take an indirect object in French, but not in English. Your father is calling you. Je résponds à la question du professeur. I answer the teacher’s question. Sa mère lui demande de nettoyer sa chambre. Her mother is asking her to clean her room. Cette semaine, il rends visite à son grandpère. He is visiting his grandfather this week. The direct and indirect object pronouns are placed before the verb even when you use the negative form. Je ne te donne pas mon nouveau pull. I will not give you my new sweater. Il ne leur parle pas. He does not speak to them. Stressed pronouns are used only to replace nouns representing people or animals. Elle pense à sa soeur. Elle pense à elle. She thinks of her sister. She thinks of her. Je travaille pour mes patrons. Je travaille pour eux. I work for my bosses. I work for them. Je vis avec mon père. Je vis avec lui. I live with my father. I live with him. Tu vas au cinéma sans ton frère. Tu vas au cinéma sans lui. You go to the movies without your brother. You go to the movies without him. Tu peux rester chez mes tantes. Tu peux rester chez elles. You can stay at my aunts’ house. You can stay at their house. B. To reinforce a subject pronoun. There is no real English equivalent. Moi, je parle très bien le français. I speak French very well. C. After the expressions c’est and ce n’est pas and, of course, their various conjugated forms. C’est ton frère qui est avec cette fille? Non, ce n’est pas lui. Is it your brother who is with this girl? No, it is not (he). D. Before and after et and ou (or). Toi et lui, vous allez bien vous amuser. You and he are going to have fun. E. In short sentences with no verb. Qui a demandé un chocolat? C’est moi. The interrogative pronoun lequel (which one) is used sometimes to replace quel + noun. Which book do you prefer? It agrees in gender and number with the noun it replaces: lequel, laquelle, lesquels, lesquelles. I have two brothers. Which one are you talking about? There are several classes to choose from at this level. Which ones do you want to attend? The demonstrative pronoun celui (this / the one) is used instead of ce + noun or le + noun. It agrees in gender and number with the noun it replaces: celui, celle, ceux, celles. Voilà les robes blanches. Ce sont celles-ci que j’aime. Here are the white dresses. These are the ones I like. Ce ne sont pas mes sandales. Ce sont celles de Sophie. These are not my sandals. These are Sophie’s. J’aime les robes blanches, surtout celles qui sont à la mode. I like white dresses, especially the trendy ones. d. Ce is the neutral simple form and is used with the verb être. C’est toujours bon de se revoir! It’s always nice to see each other again. e. Ceci and cela are the compound neutral forms. Cela me donne une idée. This gives me an idea. The reflexive pronoun shows that the action is being performed both by and to the subject. Only certain verbs have reflexive forms. Most often reflexives will show up as incorrect answer choices. mains (I wash my hands). Tu te laves les mains. You might also see moi-même, toi-même, lui-même/elle-même, soi-même (oneself), nous-mêmes, vous-même(s), eux-mêmes / elles-mêmes. They would be used as stressed pronouns would be. Tu te coupes toi-même les cheveux! You cut your hair yourself! However, there is no agreement in the sentence when the body part, or direct object, comes after the reflexive verb. We’ll talk more about this later in the review. Elles se sont lavé les mains. If the sentence contains both a direct and an indirect pronoun, order the pronouns as shown in the chart below. Always use the order below. Tu donnes le cadeau à ta sœur. Tu le lui donnes maintenant. You give the present to your sister. You give it to her now. Tu écris cette lettre à ton frère. Oui, je la lui écris. You write a letter to your brother. Yes, I write it to him. Je vous prête mes livres. Je vous les prête. I lend my books to you. I lend them to you. Ne le lui rends pas! Don’t give it back to him! Ne me les donne pas! Don’t give them to me! In affirmative commands, the me becomes moi, and the direct or indirect pronoun (moi, nous …) is placed after the verb. Give us an answer right away. Give it back to her! These are adverbial pronouns. Remember that y comes before en. Il y a beaucoup de fraises au marché ce matin. Il y en a beaucoup. There are lots of strawberries at the market this morning. There are lots of them. Il rend visite à sa tante à l’hôpital. Il lui y rend visite tous les jours. He visits his aunt at the hospital. He visits her there every day. We often meet our friends at the movies. We meet them there often. Tu m’y retrouves à six heures. You meet me there at six o’clock. Ne leur en prête pas! [You] Take care of it right away! Let’s practice our pronoun skills. Paul voulait ------- faire peur. Does the missing pronoun here serve as a subject or object? It serves as an object, so we can eliminate (A). Elle serves only as a subject pronoun or a stressed pronoun. We won’t use a stressed pronoun because a preposition is not being used. Does the verb faire peur take a direct or indirect object? Indirect. In English, “to frighten someone” takes a direct object, but in French the expression is faire peur à quelqu’un. Often, three choices will refer to one person, the fourth to more than one person. In most cases, the one that is different will be wrong. Let’s cross out (D) les, which is a direct object pronoun as well as the only plural pronoun. So, which choice is an indirect object pronoun? Lui, (C), is the indirect pronoun for third person singular. It is the right answer. La, (B), is the direct object pronoun. Je suis allé au concert sans -------. What type of pronoun would come after sans? A stressed pronoun comes after a preposition. Which of the answer choices is a stressed pronoun? Only (D). Eux is the stressed pronoun meaning “them.” (A) is an indirect object pronoun. (B) is a subject pronoun. (C) is a direct object pronoun. (D) is the correct answer: Je suis allé au concert sans eux. You also want to be familiar with some other types of pronouns that may show up. The following are most likely to appear on the real test as incorrect answer choices. Possessive pronouns agree in gender and number with the noun that they replace. Ce livre est à Nathalie. Cette montre est à Pierre. Ce livre est à toi. Ces chaussures sont à elles. Possessive pronouns must always be used with an article (le, la, les). About half of the pronoun questions revolve around the use of other types of pronouns (adverbial pronouns, demonstrative pronouns, relative pronouns, indefinite pronouns, etc.). Don’t worry—you don’t need to know the terminology. Je n’ai pas le temps de faire les courses ------- ma mère m’a demandé de faire. Let’s take a look at each in turn and see what rules govern their use. Qui is the equivalent of the English “who,” except that qui can also be used to refer to things (“that”). The qui refers to the subject of the phrase. Qui can also be used with a preposition. In this case, it can only refer to a person. Ce qui is used as the subject of the sentence or clause. Je ne sais pas ce qui la fait pleurer! I do not know what‘s making her cry! Que is used in a number of ways in the French language. On the SAT French Test, however, it usually shows up as a relative pronoun. Roughly the equivalent of the English “whom,” it refers to the person or thing that is the object of the action. Que is never used with a preposition. Ce que is used as a direct object in a sentence or clause. Je ne comprends pas ce qu‘il dit. I do not understand what he is saying. Je préfère ce que tu viens d’acheter. I prefer what you have just bought. When Do You Use Qui and When Do You Use Que? If you understand “who/whom” in English, you may want to translate and decide if “who” or “whom” is correct. If “who” is correct, use qui; if “whom” is correct, use que. What If a Preposition Is Involved? If a preposition is involved and the pronoun refers to a person, use qui or the correct form of lequel. Lequel is used with a preposition if the pronoun refers to people or things. The form of lequel agrees in gender and number with the person(s) or thing(s) it refers to. Note that if a preposition is involved and the pronoun refers to a thing, use only lequel (in its correct form). Quoi is used to refer to things only. It is usually used with a preposition when asking a question. Merci beaucoup! Il n’y a pas de quoi! Many thanks! Don’t mention it! Ce à quoi is used to emphasize an idea, but it is mostly avoided otherwise. Ce à quoi il faut toujours faire attention, c’est l’utilisation des pronoms. What you must always pay attention to is the use of pronouns. Je voudrais savoir avec quoi il a fait cela. I would like to know with what he did this. Si tu fais tes devoirs tu pourras sortir; sans quoi tu resteras ici. If you do your homework, you can go out; otherwise, you’ll stay here. Dont is correct only if the verb in the phrase is one that takes de as a preposition. Dont is always placed directly after the noun it replaces. Le livre dont j’ai besoin est dans ma chambre. The book that I need is in my room. L’ami dont elle a parlé viendra chez nous ce soir. The friend of whom she spoke will come to our house this evening. When it is separated by a preposition, use duquel, de laquelle, desquels, desquelles. L’homme à côté duquel le chien attend nous a salués. The man next to whom the dog waits greeted us. Les gens à côté desquels nous étions assis n’ont pas arrêté de parler. The people next to whom we were sitting did not stop talking. Ce dont is used as an object with a verb that takes the preposition de. Il ne comprend pas ce dont j’ai besoin. He does not understand what I need. J’ai oublié ce dont elle m’a parlé. I forgot what she talked to me about. Now let’s go back to our example first given on this page. Is a preposition involved? No. Get rid of (D) lesquelles. You can also get rid of (A) qui, because where objects are concerned, qui is used only with a preposition. Does faire take de as a preposition? No. Eliminate (C) dont. The answer must be (B) que. Voilà l’ami ------- j’ai passé l’été. Can de be used as a preposition following passer l’été? No. Eliminate (D). Can passer l’été be used without a preposition? No. Eliminate (C) que. Can passer l’été be used with chez? Yes. Passer l’été chez means “to spend the summer at the home of.” (A) is the right answer. You can use à with passer l’été, but in that case it would be used with a place, not with a person. Eliminate (B). Voilà la bibliothèque où j’ai passé beaucoup de temps. There is the library where I spent a lot of time. J’ai vu l’hôpital où je suis né. I saw the hospital where I was born. Où can in many cases be replaced by dans lequel (laquelle/lesquels/lesquelles). Où means when after the expressions au moment, à l’époque, au temps, and le jour. Use this carefully and only when it could be replaced by pendant lequel. Les jours où il n’y avait plus de pain, ils mangeaient du riz. On the days when there was no more bread, they ate rice. En replaces a noun that is used with a verb that takes the preposition de. It can be used for people or things. It is often used in sentences that refer to a number or quantity of things. We are speaking about the book. We are speaking about it. Think of en as meaning “of it” or “of them.” You can use it in some cases where the de is understood but not actually used. I have five of them. While en will usually refer to some kind of possession, it can also be used to indicate place or location if the verb in question uses de. Y often refers to place or location. Y replaces phrases that begin with prepositions that indicate place (à, chez, dans, sur). Est-ce que tu vas à la fête? Yes, I am going there. Y, an indirect object pronoun, also replaces a thing or an idea that is preceded by the preposition à.
Tu crois au Père Noël? As-tu réfléchi à ta dissertation? Have you thought about your essay? On a trois euros chacun. We each have three euros. Quelques-uns de ces livres sont à lire avant la fin du semestre. Some of those books are to be read before the end of the semester. Je peux goûter ces bonbons? May I taste these candies? Yes, take some of them. I like none of them! Aucun and aucune are always used with ne. Aucune de ces réponses n’est correcte. Quelqu‘un a volé ma moto! Est-ce que quelqu’un a vu le voleur? Did anyone see the thief? Non, personne ne l’a vu. No, no one saw him. Like aucun, personne is used with ne. Personne can be used without the ne only if it is a one-word answer to a question. Qui a cassé ce vase? Je vous ai acheté quelque chose à la pâtisserie. I bought you something at the pastry shop. Est-ce que tu as acheté quelque chose à la pâtisserie? Did you buy something at the pastry shop? Non, je n‘ai rien acheté. No, I did not buy anything. (C) Non, je n’en ai aucun. (D) Non, je n’ai pas. (A) lesquels cannot stand by itself in a sentence unless it is an answer to a question (Apporte-moi les stylos. Lesquels?). Eliminate it. (B) quelques, meaning “some,” is an adjective and can only be used to modify a noun (j’ai quelques stylos or j’en ai quelques-uns). Eliminate it. (C) aucun is used with ne. This is correct. (D) By itself, je n’ai pas does not work. It lacks a reference to what it is that I do not have. To be correct, you would need to say either je n’en ai pas or je n’ai pas de stylos. Qui va chercher le paquet à la poste? ------- vais. (A), A quoi does not work and makes no sense. It refers to things and is usually used with a preposition. (B) is correct. The y replaces the expression à la poste. (C) has two problems. First, personne needs to be used with ne. Second, personne takes the third person singular form of the verb (in this case, va). (D) En is used to show either possession or to replace a noun that works with a verb that takes de. Here the verb is aller and it takes the preposition à. So en is not correct. Hier, j’étais en train de ----(1)---- la maison quand j’ai vu à travers la fenêtre un lapin sur la pelouse. Son corps ----(2)---- brun, mais il avait des grandes oreilles blanches. Je l’----(3)---- regardé pendant quelques instants, puis en entendant un bruit il a ----(4)---- et en un clin d’œil il a disparu. 1. Which verb describes something that can be done in a house (maison)? Rouler means to roll, ranger means to tidy up, nager means to swim, and hausser means to raise. Only (B) makes sense in this context. 2. Which form of the verb être is correct here? Since the entire paragraph takes place in the past, we can eliminate both the present tense in (A), est, and the conditional in (C), serais. Now we have to choose between the passé composé in (B) or the imperfect in (D). Because the sentence is describing specific characteristics of the rabbit (lapin), we need to use the imperfect, which is used to describe states of being that are ongoing. The fact that the other verb in the sentence is also imperfect (avaitt) is another hint that (D), était, is the right answer. 3. Which form of the verb avoir is correct here? Again, all action is taking place in the past, and the other verbs in the sentence both appear to use the passé composé. Eliminate the future, (C), and the conditional, (D). In (A) we have the subjunctive form, but since there isn’t any uncertainty or emotion here, it’s incorrect, which leaves (B) as the correct answer. 4. Which past participle has the correct meaning for the sentence? Translating the second half of the sentence, we learn that upon hearing a noise (en entendant un bruitt), it (the rabbit) does something and in the blink of an eye, it disappears (en un clin d’œil il a disparu). (A) means the rabbit chose something, which doesn’t fit. (B) doesn’t work either, as the rabbit didn’t establish anything. (C) is the past participle of bondir, which means to leap; this would be a logical thing for the rabbit to do. (D) suggests the rabbit slept, which isn’t correct. (C) is the right answer. Answers can be found in Chapter 8. 1. ------- est arrivé à Paul hier? 3. C’est grâce à ------- que nous avons pu venir. 4. La chose la plus difficile est de ------- réveiller le matin. 5. ------- a sorti la poubelle. There are three areas that verb questions tend to test: use of the subjunctive, agreement of the past participle, and tense. About 25 percent of the grammar questions on the test deal with verb use. Over half of them ask you to decide whether or not to use the subjunctive. Like the indicative, the subjunctive is not a tense; it is a mode or mood. While it is not often used in English, it is used very frequently in French. This is why it is always found on the SAT French Subject Test. When Do You Use the Subjunctive? In French and on the SAT French, you will use the subjunctive in phrases that follow expressions of doubt, suggestion, preference, desire, improbability, or emotion. The subjunctive is also used with certain conjunctions. All phrases that require use of the subjunctive will contain the wordque. You must use the indicative mode with verbs expressing an opinion, such as penser que, croire que, espérer que, être sûr que, être certain que when they are used in the affirmative form. Je crois que vous avez raison. Nous pensons que tes parents seront contents de te revoir. We think your parents will be happy to see you again. Compare the above examples to the following examples, which display these verbs used in the negative form. The negative form makes a difference! Je ne crois pas qu’il ait raison. I don’t think he’s right. Nous ne pensons pas que tes parents soient contents. We don’t think your parents are happy. Je doute qu‘il réussisse son examen. I doubt that he will pass his exam. J’ai peur qu‘il rate son examen. I am afraid that he will fail his exam. Je ne crois pas que vous ayez raison. I don’t believe that you are right. Il est douteux qu‘elle vienne ce weekend. It’s doubtful that she will come this weekend. Il est possible que j’aie tort. Je préfère que vous rentriez tout de suite. I prefer that you return at once. Je tiens à ce que tu sois à l’heure. I insist that you be on time. Il vaut mieux que vous ne sortiez pas ce soir. It is better that you do not go out tonight. Il est important que vous étudiez l’emploi du subjonctif. It is important that you study the use of the subjunctive. Il faut que je prenne un rendez-vous chez le dentiste. It is necessary that I make an appointment at the dentist’s. Je veux que tu travailles plus sérieusement. I want you to work more seriously. Je souhaite que tout se passe bien. I wish that everything goes well. Je désire qu‘il soit heureux. I want him to be happy. Il est peu probable qu’il neige demain. It is unlikely that it will snow tomorrow. Note: Do not use the subjunctive with probability. Il est probable qu‘il pleuvra demain. It is likely that it will rain tomorrow. Je suis étonné qu‘il ne soit pas encore là. I am surprised that he is not yet here. Je suis content que tout se soit bien passé. I am happy that everything went well. Je regrette que le temps passe si vite. I am sorry that time goes by so quickly. Cet homme est le seul qui sache encore travailler de ses mains. This man is the only one who still knows how to work with his hands. C’est la meilleure nouvelle que vous puissiez lui donner. It is the best news that you can give him. Il est probable qu’il neigera demain. It is probably going to snow tomorrow. Je me demande s’il viendra. I wonder if he will come. Beware of ne used as an expletive after avant que, de peur que, de crainte que, avoir peur que, craindre que, and à moins que. It is not a negative form. Je vais aller me promener avant qu’il ne pleuve. I will go for a walk before it rains. Je crains qu’il ne pleuve. I am afraid it might rain. You won’t have to construct the subjunctive of a given verb; you only need to recognize it among the four answer choices. In addition to the present subjunctive, you may also see the past of the subjunctive. You’ll recognize it because the auxiliary or helper verb (avoir or être) will be in the subjunctive. Note that with avoir, il a becomes il ait and with être, il est becomes il soit. Je sais qu’il vient ce soir. I know that he is coming tonight. Je doute qu’il vienne ce soir. I doubt that he is coming tonight. Je sais qu’il est venu hier. I know that he came yesterday. Je doute qu’il soit venu hier. I doubt that he came yesterday. Jean-Paul ne m’a pas téléphoné; j’ai peur qu’il ------- oublié notre rendez-vous. Does the expression J’ai peur que … take the subjunctive? Yes! It shows doubt, fear, or uncertainty. The answer is (C). Ma mère m’a grondée quand elle ------- ma robe déchirée. Does the expression Ma mère m’a grondée quand … take the subjunctive? No. The verb in this case (voir) is an actual event. Eliminate (C) and (D). This sentence requires the past, so the answer is (B). Also, note that we have quand here and not que. Détruisez les preuves avant qu’il n’ ------- ce que nous avons fait. Is avant que a conjunction that takes the subjunctive? Yes. The answer is (B). (A) is the future. (C) is the conditional. (D) is the present. You remember all those fancy verb tenses you learned in French class: the passé simple, the future perfect, the pluperfect subjunctive? Well, for the purposes of this test, you can forget them. For the SAT French, you need to recognize the present, the imperfect, the passé composé, the future, the conditional, the past of the conditional, and the plus-que-parfait, and you must know when to use them. The subjunctive, actually a mode or mood rather than a tense, is the verb form most frequently tested. The conditional, also a mode or mood, is the next most frequently tested verb form. This is pretty straightforward. It’s the form of the verb you’re most used to seeing. The imperfect tense is a form of the past that indicates something was ongoing: either something that went on for a period of time in the past or something that happened repeatedly in the past. This tense indicates that a past action (or state) is now complete. It is made up of an auxiliary verb (either avoir or être in the present tense) and a past participle. It indicates something that started and ended in the past and is now over. The past imperfect indicates that something happened in the past prior to another action in the past. It is made up of an auxiliary verb (avoir or être in the imperfect tense) and a past participle. This indicates that something will happen in the future. The conditional mode or mood is used to describe what people would do or what would happen if a set of conditions were met. In most cases it is used with another clause starting with si. Si cela arrivait, il partirait. Il partirait si cela arrivait. The conditional is also used as a polite way of requesting things. Je voudrais une baguette, s’il vous plaît, madame. I would like a baguette please, madame. Almost half of the questions that relate to verb sequence test you on the use of the conditional. The conditional is used in a sentence if there is a clause that begins with si and uses the imperfect tense. Si j’avais le temps, je le ferais moi-même. If I had the time, I would do it myself. You will use the conditional before or after clauses that start with and contain the imperfect. If the past imperfect is used, then the past conditional will be used. Si j’avais eu le temps, je l’aurais fait moi-même. If I had had the time, I would have done it myself. Aujourd’hui, il fait ses devoirs. Quand il était petit, il faisait ses devoirs. Hier il a fait ses devoirs. J’avais déjà fini mes devoirs quand il est parti. Demain, il fera ses devoirs. S’il avait des devoirs, il les ferait. In questions with several verbs, the tenses and mode must follow a logical sequence. j’aurais fait ce voyage en Afrique. 1. In the sequence of future events, one action must be finished before the other can take place. Je pourrai répondre à ta question quand j’aurai parlé à mon frère. I will be able to answer your question when I have talked to my brother. 2. In the future, the actions in both clauses will take place at the same time. Je vous appellerai quand il arrivera à la maison. I will call you as soon as he arrives. Je sortirai aussitôt que mon travail -------. What tense is correct? It is not a si clause or any form of politeness; therefore, it cannot be conditional mode. Eliminate (B) and (D). The conjunction aussitôt que indicates that one action has to take place before the other. Eliminate (A). (C) is the correct answer. Si j’étais riche, je ------- un yacht. What tense is correct here? Because si is used with the imperfect, the following verb must be the conditional. How do we recognize the conditional? It combines the structure of the future with the endings of the imperfect (ais, ait, etc.). (D) is the correct choice. Avant d’entrer au restaurant, il m’a demandé si j’ ------- assez d’argent pour payer le dîner. What tense is correct here? (A) cannot be correct. It is the present tense, and the previous clause, il m’a demandé, tells us the action is in the past. Since (D) is the future, we can eliminate it as well. Do we use the imperfect or the past? (C) implies that having enough money was an event or action that occurred once prior to the question. Because we have the phrase, avant d’entrer, we know that the state of having money is an ongoing one, preceding and presumably continuing throughout dinner. (B) is the correct answer. Make sure you can identify which tense (or mood) is which. With donner, as in all regular “er“ verbs, the singular forms of the subjunctive present are identical to the indicative present. What Is an Auxiliary Verb? It is a verb that loses its own meaning to help form a compound past tense for other verbs such as the passé composé, plus-que-parfait, passé du subjonctif, conditionnel passé, and futur antérieur. Some verbs take either avoir or être. To make a sweeping generalization, most verbs takeavoir, but verbs that indicate a change of place (aller, venir, partir) or state (naître, mourir, devenir…) and all reflexive verbs (se laver, se lever …) take être. Sound tricky? Just remember Dr. and Mrs. Vandertramp. What Is a Past Participle? A past participle is the form of the verb that combines with “to have” (in English), or être or avoir (in French), in order to make the past tense. Je mange mon petit déjeuner. J’ai mangé mon petit déjeuner. You’ll most likely be given the choice of four different forms of the past participle—masculine singular, feminine singular, masculine plural, and feminine plural—with an occasional infinitive thrown in to confuse you. You must decide which is correct. When Does the Past Participle Agree, and with What? · The verb takes être as its auxiliary verb and there is no direct object placed after the verb. Pauline et Chantal sont parties hier pour l’Afrique. Pauline and Chantal left for Africa yesterday. · The verb is reflexive and therefore takes être, and there is no direct object. Elle s’est évanouie quand elle a entendu la nouvelle. She fainted when she heard the news. · The reflexive verb has a direct object placed before the verb. La jambe qu’elle s’est cassée en skiant lui fait toujours mal. The leg she broke skiing is still painful. · The verb takes avoir and has a direct object placed before the verb. La fille que nous avons vue au café est ma meilleure amie. The girl we saw in the café is my best friend. When Is There No Agreement? 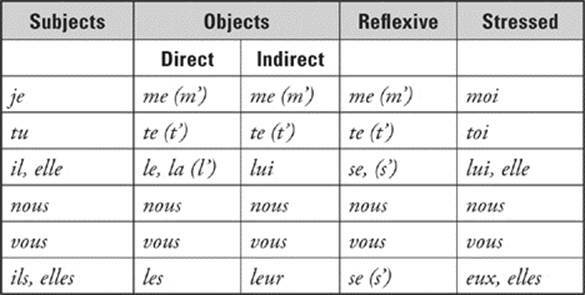 · The reflexive verb has a direct object (usually a body part) placed after the verb. Elle s’est piqué le doigt en cousant. She pricked her finger while sewing. Elle s’est lavé les cheveux ce matin. She washed her hair this morning. · The verb takes avoir and has a direct object placed after the verb. J’ai vu ma meilleure amie au café aujourd’hui. I saw my best girlfriend in the café today. Since questions in Part C often contain several sentences, information about the gender and number may come earlier than the sentence in which the blank appears. Les deux soeurs ont très bien ------- à l’université. The verb réussir (to succeed, to be successful) uses the auxiliary verb avoir. Is there a direct object that precedes the verb? No. There is no direct object in this sentence. The correct answer is (A). La fille à côté de moi m’a donné les renseignements dont j’avais besoin. Je l’ai -------. The verb remercier (to thank) also takes avoir as its helper verb. Is there a direct object before the verb? Yes, “l“ ‘ refers to la fille. The correct answer is (B). There is a small chance that you will have a question or two on other participles: the present participle, the gerund, or the perfect participle. You don’t need to know these terms—just be able to recognize how they work in a sentence. This type of question is most likely to appear on Part C, where you choose the appropriate form of the verb based on the sequence of tenses in the paragraph. The present participle is a verb form that ends in “-ing” in English. It shows that one action is happening at the same time as another. J’ai vu les enfants courant sur la pelouse. I saw the children running on the lawn. The present participle “running” is also acting as an adjective, describing something about the children. Elle montait l’escalier en chantant. She climbed the stairs while singing. En lisant, nous découvrons de nouveaux mondes. In reading, we discover new worlds. Eric apprend à danser en regardant des vidéos. Eric learns how to dance by watching videos. The perfect participle (made up of ayant or étant + the past participle) is the past tense of the present participle. An example in English would be “Having won the war, the army celebrated.” This form is used to show that one action was completed before another began. Ayant fini le repas, nous avons débarrassé la table. Having finished the meal, we cleared the table. Étant montée, elle ne pouvait plus entendre la discussion. Having gone upstairs, she could no longer hear the discussion. 1. Si -------, je préparerais le dîner. 2. Paul regrette que nous ------- pas réussi. 3. -------une lettre quand on a sonné à la porte. 4. Elle n’a jamais oublié ce que nous ------- au moment de son départ. 5. Est-ce que vous ------- contents si je n’avais pas accepté l’invitation? 6. Nous doutons ------- leur rendre visite chez eux. 7. -------, elle est partie pour le long trajet chez elle. 8. Tu pourras regarder la télé une fois que tu ------- ton travail. Below is a list of the most important prepositions for you to know. Just as in English, certain verbs or expressions in French require prepositions while others require none. Memorization is the key here. These questions will ask you for the preposition required. Some verbs can take more than one preposition depending on the meaning. In some questions, you will have the option of no preposition, denoted by a dash in the answer choice (——). Il a refusé -------faire son lit. Out of context, refuser could take the preposition à or de, or no preposition at all. Each has a different meaning. Le juge a refusé les droits de visite à la mère. The judge denied visitation rights to the mother. L’enfant a refusé de manger ses carottes. The child refused to eat her carrots. Which is appropriate for this question? Because someone is refusing to do something in this sentence, the correct answer is de, choice (C). Keep in mind that the verb’s appropriate preposition may determine your choice of pronoun. If a verb requires a preposition in a given circumstance, for example, then you know that it takes an indirect and not a direct object. Or, if a given verb requires de, the relative pronoun used with it will reflect that. C’est la robe ------- j’ai envie. The verb avoir envie takes the preposition de. (A) can be eliminated because que is never used with a preposition. (B) can also be eliminated because qui cannot be a subject here (j’ is the subject). Avoir envie takes de, so (D), which is used with à, cannot be right. (C) dont is correct becausedont in a sense means de + que. Your experience studying French will probably provide you with a good sense of which verb takes which preposition, if you take the time to think about it. 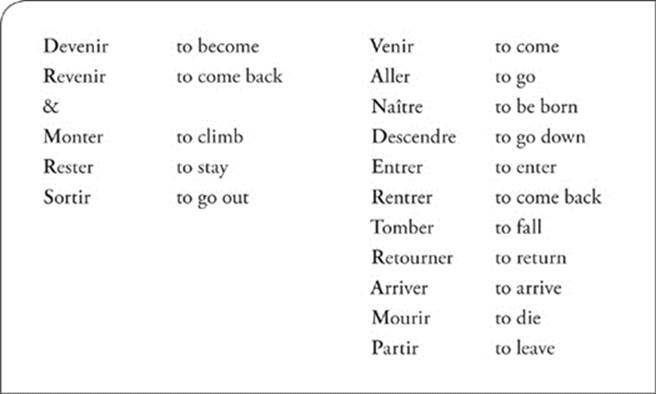 To refresh your memory, here is a partial list of verbs. Some never take a preposition, others sometimes take a preposition, and still others always take a preposition. Verbs that don’t take prepositions will be used with either the infinitive (the “to” form of a verb) or a direct object. Some verbs can be used with both. Je peux faire n’importe quoi. I hope to come tomorrow. Il a mis le vase sur la table. He put the vase on the table. Marie a fait la vaisselle. Il a acheté trois pantalons. He bought three pairs of pants. Je vais chercher ma soeur à l’école. I am going to get my sister at school. I am going to the United States. Je refuse de faire mes devoirs. I refuse to do my homework. J’ai oublié de dire au revoir. I forgot to say good-bye. J’accepte de nettoyer la cuisine. I agree to clean the kitchen. I am counting my change. Nous comptons sur vous pour nous aider. We count on you to help us. Je réfléchis à mon avenir. I am thinking of my future. Je pense à ma mère. I am thinking of my mother. Que pensez-vous du nouveau président? What do you think of (about) the new president? Je participe aux Jeux Olympiques. I am in the Olympic games. Est-ce que vous allez assister au concert? Are you going to attend the concert? Faites attention aux assiettes en porcelaine! Be careful with the porcelain plates! Les élèves répondent aux questions du professeur. The students answer the teacher’s questions. Le soldat obéit aux ordres. The soldier obeys the orders. De quoi parlez-vous? Du chat? What are you talking about? About the cat? I am afraid of spiders. I come from the supermarket. I feel like having a coffee. J’ai besoin d’un crayon pour écrire. I need a pencil to write. Certain rules govern the use of some prepositions. Use en for feminine, singular countries. Use au (à + le) for masculine, singular countries. 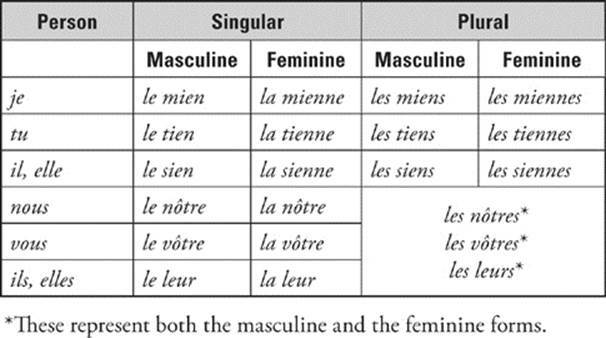 Use aux (à + les) for plural countries, whether feminine or masculine. being in or going to a city. Use de or des for feminine countries. 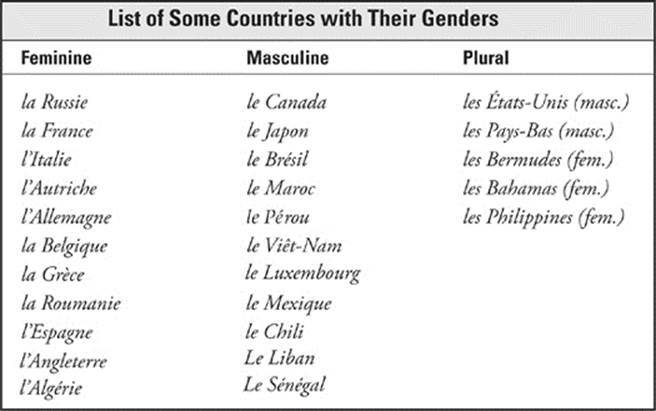 Use du or des for masculine countries. Use de for all towns. To describe the material an object is made of, use either de or en + the name of the material. You will want to be able to recognize French adverbs and not get puzzled by their various forms. In English, most adverbs are formed with an adjective + the suffix –ly. In French, most adverbs are formed with the feminine form of the adjective and the suffix –ment. When the adjectives end with −i, −ai, −u, and –é, the adverbs are formed with the masculine form of the adjective. When the adjectives end with –ant or –ent, the endings of the adverbs change to –mment. Il y a encore des places debout dans la salle de spectacle. Mettez les bagages dans les coffres arrière. Les roues avant sont à changer. 1. Marie ------- les résultats de ses examens. 2. Je ------- de leur écrire. 3. Je n’ai jamais eu l’occasion ------- voir ce film. 4. -------le concert, elles bavardaient sans cesse. 5. Je la vois souvent à -------. 6. Elle n’a pas réfléchi ------- de refuser l’offre. At most, these topics will come up once or twice on the test. Adjectives modify nouns. Adverbs modify verbs, adjectives, and other adverbs. In French, adverbs often end in -ment. Elle a remplacé le vase -------. (A), (C), and (D) are all adjectives. (B) is the right answer. When modifying an adjective, use the adverbs trop, plus, très, si, or moins. Mieux, like pire, cannot be used to modify an adjective. Ce cassoulet est ------- bon. Bon is an adjective. The word in the blank must be an adverb. Only si is an adverb that can be used to modify an adjective. (C) is the right answer. If you use être with the past participle of a verb that normally takes avoir, you are forming the passive tense of the verb. Le facteur distribue le courrier. The postman delivers the mail. Le courrier est distribué par le facteur. The mail is delivered by the postman. Possessive adjectives (not pronouns) show that a given noun belongs to a given person. But, unlike in English, French possessive adjectives agree with the gender and number of what is owned, not who owns it. The form of the adjective also changes depending on whether the noun begins with a vowel (or a silent “h”). Son is the masculine singular and sa is the feminine singular. However, if a feminine noun begins with a vowel or a silent “h,” the possessive adjective that goes with it will be son. Sa does not shorten to s‘. Elle avait de la soupe dans ------- assiette. Assiette is feminine, but the word begins with a vowel; you can’t say sa assiette, so eliminate (B). Possessive adjectives don’t contract, so eliminate (C). 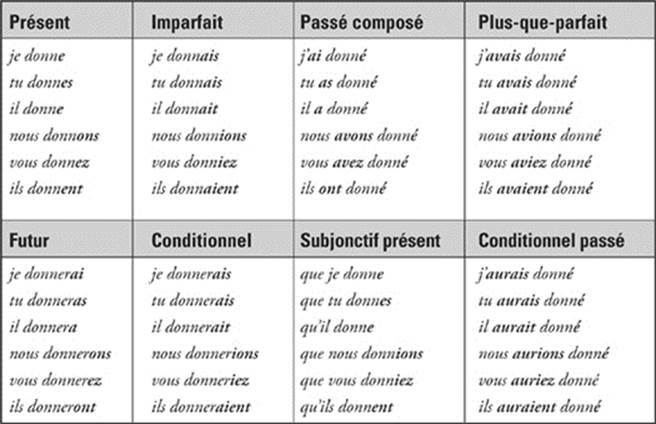 Assiette is singular; cancel (D), which is plural. (A) is the right answer. 1. Is It Vocabulary or Grammar? How can you tell? A vocabulary question will have four words with clearly different meanings. A grammar question will usually have one word in four different forms (for example, the same verb in four different tenses or with four different prepositions). When you see practice examples, the difference will be obvious. The paragraph is telling a story, so all sentences are connected. The key to this section is realizing that the correct answer can be based on both the sentence with the blank and on the sentences that precede it. You may even need to read past the blank sometimes in order to get a better understanding of what’s going on. Don’t think of each sentence as a separate question. Some grammatical points are tested more frequently in Part C than in Part B. All the following points are thoroughly discussed earlier in this chapter. The action described in the paragraph must unfold in a logical sequence. Make sure all the verbs that you choose as answers match the tense of the story. Pay special attention to the rules for use of the imperfect and the conditional. As we discussed earlier in this chapter, a past participle will agree with the subject if the verb takes être. If the verb takes avoir and the direct object comes before the verb, it will agree with the object of the sentence. In some cases, whether the direct object is masculine or feminine is revealed in a previous sentence. Check which pronoun should be used in the sentence. Is it subject, direct object, indirect object, stressed, demonstrative, interrogative, reflexive, relative, indefinite, or another type of pronoun? · Check its gender and number if needed (masculine, feminine, plural). · Check whether it is also replacing a preposition. · Check where it is placed in the sentence relative to the verb. Can you figure out the tense or mode, the use of the auxiliary verb, the agreement with the past participle, the tense sequence, or the specific use of certain verbs? · Check the subject of the sentence. · Check the tense sequence by looking at the meaning of the main clause. · Check whether the verb takes être or avoir in compound past tense. · Look at prepositions and conjunctions to help you decide what verb form or mode you should use. Can you specify which one to use with which verb? What is the meaning when the preposition is combined with certain verbs and other words? How could it be replaced by a pronoun in a sentence? · Check whether the verb takes de or à. · Check whether the general meaning of the sentence indicates a place, a time, a cause, or something else. · Check if the preposition is included in a pronoun form or if it should be transformed (dont, auquel, duquel, etc.). Can you see the difference between adjectives and adverbs? · Check the word’s position in the sentence. · Check the ending of the word and memorize the irregular adverb forms so you don’t get tricked. Directions: Each of the following sentences contains a blank. From the four choices given, select the one that can be inserted in the blank to form a grammatically correct sentence. Choice (A) may consist of dashes that indicate that no insertion is required to form a grammatically correct sentence. 1. Marie a ------- à m’offrir. 2. Claude ------- de faire les courses. 3. C’est grâce à son ------- qu’il a réussi. 4. Je ferai la vaisselle -------. 5. C’est ------- qui a gagné! 6. Nos voisins ------- aller à la piscine. 7. Je ------- demande s’il est temps de partir. 8. Les dames sont arrivées avec -------. 9. La voiture verte est -------. 10. L’année dernière j’ai voyagé en -------. 11. La réussite de ce projet est -------. 12. ------- ce soit fini. 13. C’est le collègue ------- j’ai beaucoup parlé. 14. -------est le metteur en scène de ce film? 16. Le gouvernement ------- de négocier un accord. 17. -------qu’il sache les nouvelles d’hier. 18. Jean a réussi à trouver du travail ------- la grève. 20. C’est le gâteau le plus délicieux -------. Directions: The paragraphs below contain blank spaces indicating omissions in the text. For some blanks it is necessary to choose the completion that is most appropriate to the meaning of the passage; for other blanks, to choose the one completion that forms a grammatically correct sentence. In some instances, choice (A) may consist of dashes that indicate that no insertion is required to form a grammatically correct sentence. In each case, indicate your answer by filling in the corresponding oval on the answer sheet. Be sure to read each paragraph completely before answering the questions related to it. Si j’avais su, ----(21)— aller avec Marie et Christine. Trop tard, j’ai essayé de ----(22)---- téléphoner chez ----(23)---- mais ----(24)---- n’était là. ----(25)----, j’ai tenté de les retrouver au café. Quand ----(26)----suis arrivé, je les ai ----(27)---- entrer ----(28)---- cinéma. Avant ----(29)---- partir en vacances, Jean et Camille ont ----(30)---- à l’aéroport ----(31)---- demander ----(32)---- l’avion partait ----(33)----.